In 2018, Immigrant Hope centers saw a total of 618 clients across 7 locations. Half of the clients were low-income and three quarters qualified for reduced or waived fees. Of those clients, about one third did not proceed beyond a Consultation. 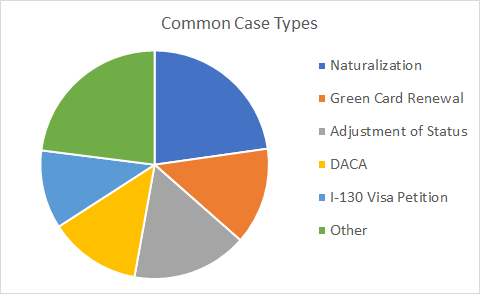 The most common cases that did proceed to representation. We also represented clients on 20 other types of cases, including asylum, religious worker visas, refugee relative petitions, and visas for victims of crime and domestic violence. 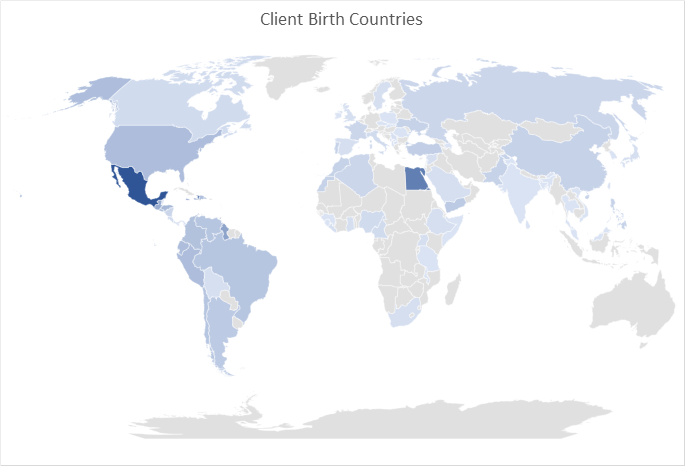 Our clients were born in 81 different countries. More than one third came from Mexico, but the remainder were spread around the globe. Other common birth places included Haiti, Egypt, Jamaica, Guyana, Guatemala and Trinidad and Tobago.